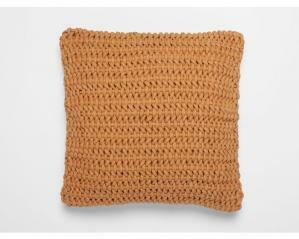 The Woven Rope Pillow adds texture and earthy color with organic cotton. Woven Rope Pillow: 100% GOTS-certified organic cotton is grown and woven in India. The Woven Rope Pillow adds texture and earthy color. The cover is 100% GOTS-certified organic cotton grown and woven in India. The pillow insert is an organic kapok filled pillow with natural organic cotton cover. This Decorative pillow can be used with many collections but is most popular with our Lost Coast Duvet Cover and Shams which layer soft, substantial organic cotton over the luscious drape of Relaxed Linen Sheets, the palette of warm terra-cotta and soft gray evoking sunset by the sea. The Woven Rope Pillow adds texture and earthy color, while the Cascade Coverlet lends an inviting layer of extra coziness. Lost Coast Duvet Cover & Shams: 100% organic cotton is grown and woven in India. Relaxed Linen Sheets: Linen is made in Portugal from flax grown in Europe. Woven Rope Pillow: 100% GOTS-certified organic cotton is grown and woven in India. Cascade Coverlet: 100% organic cotton is grown in India and woven in Portugal.